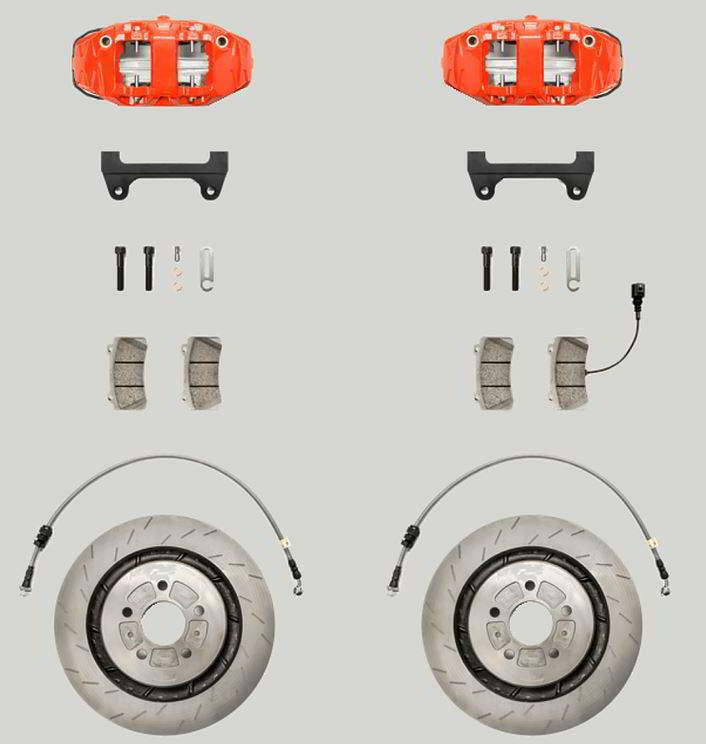 Our new Performance Brake upgrade is packed with features, bringing a real supercar look and feel in the braking department – all at an affordable price. All the power in the world is next to useless if your stock brakes aren’t up to it. 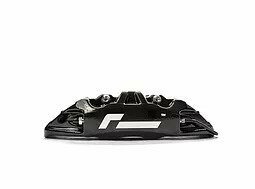 Our RacingLine Monoblock Performance Brake Upgrade is an ultra-durable braking solution developed exclusively for VWG cars. 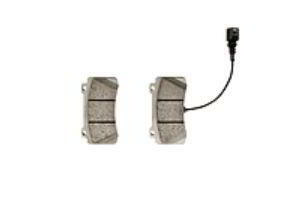 We’ve developed these brakes from our decades of motorsport experience, and, as you’d expect, they provide outstanding stopping power again and again. Yet, all at an affordable price. 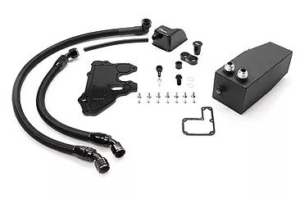 The kit comes in at almost half the weight of the original for significant unsprung mass savings. The caliper, pads and bracket assembly weigh in at 4.4kg (9.7lb) vs 8.6kg (18.9lb) for the factory Golf 7R kit. Smart design features such as our Hub Adaptor system plus built-in pad-wear indicators are all part of RacingLine’s typical attention to detail. 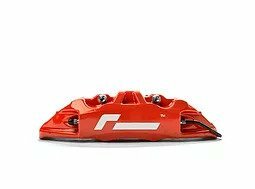 The ‘Monoblock’ construction of our 4-piston aluminium thin-profile calipers give extreme stiffness and light weight, and aid in wheel clearance packaging. 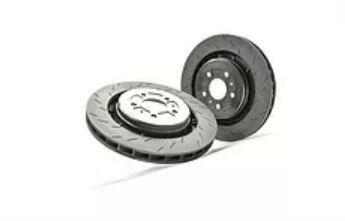 Discs made from high cast carbon – a mixture of high quality steel combined with carbon; giving a far higher friction coefficient compared to normal steel rotors. Composite Ceramic Sport Pads are included with the ideal compound for fast-road use. Unusually for a brake upgrade kit, we’ve included pad wear sensor. 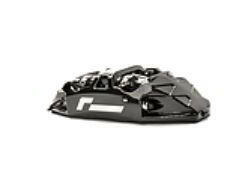 Other pad compounds are also available for track use. 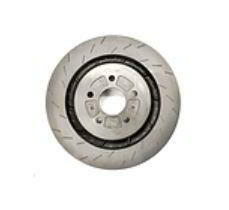 The discs, with integral mounting bells, use our ‘Triple Groove’ design across the face for improved bite and debris clearance. Engineered exclusively for VWG cars, with piston sizes matched to master cylinders and servos for perfect responses. A full kit of supporting bells, brackets and lines included. Everything you need for installation: discs, callipers, mounting brackets, fast road pads, braided steel lines. Plus the option of Hub Adaptors for extra wheel clearance. Bolt on & drive! Ideal colour for R models. Colour matched to factory GTI. 345x28mm one piece disc with directional curved cooling vanes. 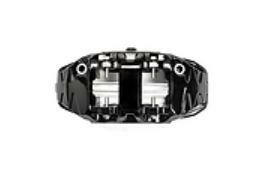 Triple hook groove design for improved bite & debris clearance plus reduced distortion / vibration. Cast Carbon disc material withstands high temperature stresses without excessive material expansion. Composite Ceramic fast-road pads with working temperature 50C-700C & 0.48 friction rating. Alternative pads for track use are available. Braided stainless steel brake lines for firm pedal response. Clearance over big brake kits is always a challenge, especially when used under factory wheels. RacingLine’s brake kit features our unique design that allows these 5mm Hub Adaptors to be solidly, mechanically mounted onto the front face of the disc to give you that extra clearance. No more adding loose spacers onto your car (and approved in markets where spacers are illegal). Changing your rims? Swapping from summer to winter wheels? Or track to road wheels? No problem, the Hub Adaptors are installed and removed in minutes. We recommend this 5mm Hub Adaptor for anyone using this brake kit under factory wheels. Saving unsprung weight is really important on a performance car. 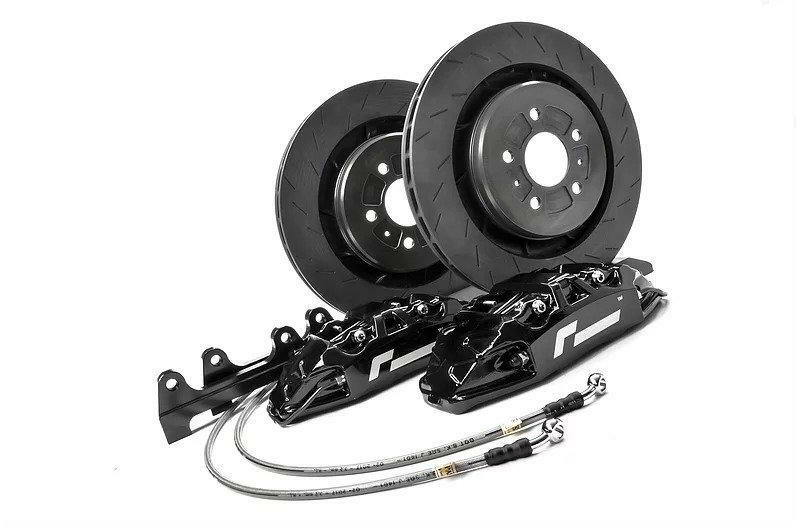 All those heavy masses on the ‘road-side’ of your springs – the wheels, tyres, suspension arms and of course brakes – make a massive difference to the car’s responses as it turns and handles bumps in the road, differences you can really feel as a driver. So we’ve spend a lot of our development and design time making sure that our Performance Brake Kit cuts as much weight out as possible. Our Monoblock Aluminium construction is the key to this saving – a single piece caliper is stronger, stiffer and can therefore be lighter than equivalent 2-piece calipers. Braking upgrades aren’t really about the stopping difference for a single stop. No, the main reason for using bigger brakes is to increasing the heat capacity when you’re stopping hard again and again. This really matters for repeated stopping when, say, you’re running hard down a mountain pass with no cool-down, or working the car hard around the track. This really shows on our testing. After just five hard stops from 60mph (100kmh), the difference in stopping distance between stock Golf 7.5R brakes and the RacingLine Performance Brakes is getting really noticeable. The factory brakes are fading fast, the pedal is getting closer to the floor and all the ‘bite’ has gone. Increase the speeds, or do more heavy stops and the factory brake set up is really starting to get beyond its limits. Meanwhile, the RacingLine brakes perform the same on stop 5 as they did on stop 1. The pedal is firm, the bite is still there, and the feel underfoot is still as reassuring as ever. And ready for more. Minimum 18″ wheel diameter required​. 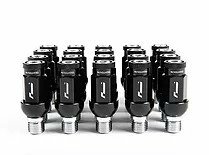 Our Hub Adaptors recommended for use with factory wheels. 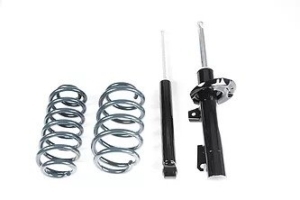 A fully matched spring and damper kit to tighten up your handling and drop your ride height. Remove and refit your wheels all the time? Our Stud & Nut kit is a much quicker method to swap wheels for motorsport / track use. An essential upgrade for any high-power or track car. Our Oil Management kit keeps inlet clean and protects from oil surge.